What are the chances? Paul Thomas Anderson's epic 1999 film Magnolia, linking multiple plots and characters, refers, in an opening sequence, to the suicide of a young man, Sydney Barringer in 1953. He jumped from an apartment block roof, but when falling, he passed his and his parents' apartment, and at that very moment, in a extraordinary split-second of coincidence, he was fatally hit by a bullet accidentally shot from a gun held by his own mother when she was having a daily argument with his father. Sydney, depressed, had ironically loaded the gun himself a few weeks early to cause one of his ever-rowing parents to kill the other, but without that bullet, he would have been saved by newly installed netting at the foot of the building. In the end, both of his parents were convicted of murder. But did this really happen? Or perhaps it is based on a fictional case of Ronald Opus, originally told by Don Harper Mills, then president of the American Academy of Forensic Sciences, in a speech at a banquet in 1987? Perhaps it was. Also mentioned in the film are three men convicted of murdering Sir Edmund Berry, who were promptly hanged at Greenberry Hill in London in 1911. The mens' names were Green, Berry and Hill. But again another piece of poetic licence. This was really in reference to the mysterious death of Sir Edmund Berry Godfrey in 1678, for whose murder three men were hanged on 5 February 1679 at Primrose Hill. For a time this was known as "Greenberry Hill", because of the hangings of Green, Berry and Hill – a retrospective ‘coincidence'. Then again, the story goes that on 5 December 1664 a ship in the Menai Strait, off North Wales, sank with 81 passengers on board. There was one survivor a man named Hugh Williams. On the same date in 1785, another ship sank in the same area with 60 passengers on board. There was one survivor – a man named Hugh Williams. On the very same date in 1860, a ship sank with 25 passengers on board. And guess what the survivor was called, a man named Hugh Williams. There is at least partial truth to this, but then again, Hugh Williams is a very common name in Wales, and the Menai Straits was a hazardous area for ships. Yet coincidences, big or small do happen all the time. Travelling in London, I’ve seen same person twice in the same day in completely far apart random places among a population of millions, and I’m sure they weren’t stalking me. I hope. And have you ever discovered that before you met your wife, husband or partner, you retrospectively hung out regularly in the same out in the same place, such as a bar, years before you actually met, and unwittingly perhaps sat next to or even spoke briefly? Or how many surprise mutual friendship connections there are from a variety of apparently disparate sources. Or is that because of shared interests, and that we are all part of some massive genetic jigsaw puzzle of interlocking characteristics that meet up? So this week our song theme is all about the topic of coincidence and chance, whether that is real, or perceived. Many of your songs might concern relationships, where an encounter is seen as destiny, or a moment to take a chance. But they could also detail chance events, moments or meetings of other kinds. Songs might celebrate these coincidences, or bemoan them, or both. After all, in Casablanca, Rick is in despair that is former lover Ilsa Lund happened to walk into his gin joint, but then of course he also cannot but be in rapture about it. Now here’s Julio Cortázar, now quoting from Around the Day in Eighty Worlds: “We know that attention acts as a lightning rod. Merely by concentrating on something one causes endless analogies to collect around it, even penetrate the boundaries of the subject itself: an experience that we call coincidence, serendipity – the terminology is extensive.” So if you’re in the right state of mind, and looking for it, perhaps, as Douglas Coupland says, “Every single moment is a coincidence.” The world is full of infinite connections, yet it only some we perceive, at random, or by chance. After all, how many more times, does it not happen? Presidents by more than numbers? "Abraham Lincoln was elected to Congress in 1846. John F. Kennedy was elected to Congress in 1946. Abraham Lincoln was elected President in 1860. John F. Kennedy was elected President in 1960. 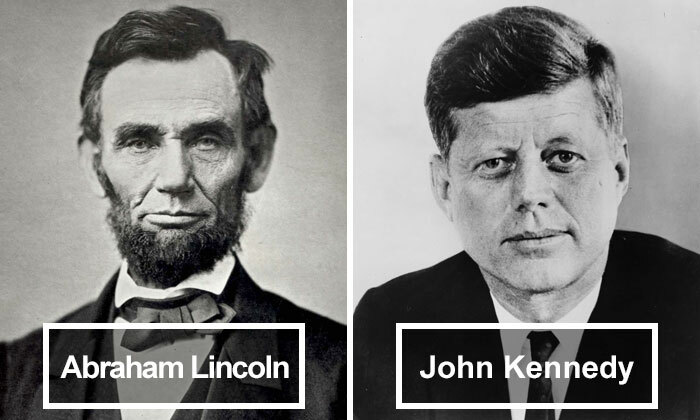 The names Lincoln and Kennedy each contain seven letters. Both were particularly concerned with civil rights. Both wives lost their children while living in the White House. Both Presidents were shot on a Friday. Both were shot in the head. Lincoln's secretary was named Kennedy. Kennedy's secretary was named Lincoln. Both were assassinated by Southerners. Both were succeeded by Southerners. Both successors were named Johnson. Andrew Johnson, who succeeded Lincoln, was born in 1808. Lyndon Johnson, who succeeded Kennedy, was born in 1908. John Wilkes Booth, who assassinated Lincoln, was born in 1839. Lee Harvey Oswald, who assassinated Kennedy, was born in 1939. Both assassins were known by their three names. Both names comprise fifteen letters. Booth ran from the theatre and was caught in a warehouse. Oswald ran from a warehouse and was caught in a theatre. Booth and Oswald were both assassinated before their trials. A week before Lincoln was shot, he was in Monroe, Maryland. A week before Kennedy was shot, he was with Marilyn Monroe." Perhaps you could also add that both were human beings. But links between two people, and numbers can still be extraordinary. Take, for example, the first and last military casualties of the First World War. Private John Parr was killed 17 days after Britain declared war. Private George Ellison died 90 minutes before the armistice, and they are not only both buried in St Symphorien military cemetery, just south-east of Mons in Belgium, but their gravestones are, by rather tellingly, by chance, facing each other. Facing each other? Look at this much celebrated comparison between the founder of the Ferrari company, Enzo Ferrari, who died on August 14, 1988. Just a month later, on October 15, Arsenal footballer Mesut Özil was born. Reincarnation, coincidence, or just a broad gene pool? Surely it can’t also just be coincidence that the creator of an evil media empire, Rupert Murdoch and creator of an evil race of robot-driving aliens, Davros, of the Daleks, look remarkably similar, can it? Davros, left, and Rupert Murdoch, right. Or indeed that the recently discovered, 540 million-year-old fossil of the Saccorhytus coronarius, might be related to another primitive mouthy monster of more recent times, a certain Donald J Trumpus? Surely there’s no connection between these two – soft-soulers and post-punkers? Oh yes there is. They are both from Manchester! What is the chance of that? Can there any connection between an American Christian singer and an angry urban writer from Salford? Well no. Or is there? Grant’s first No 1 single was a duet, entitled The Next Time I Fall. Spooky!